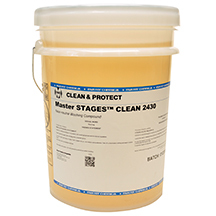 Master STAGES™ CLEAN 2430 is a highly-concentrated, mild pH, liquid parts washing compound/corrosion inhibitor made for aluminum alloy and steel alloy parts as well as cast iron, copper, brass, and bronze. This product does a great job in single and multi-stage spray washers providing great detergency and long life. CLEAN 2430 may be used in medium and high-pressure spray washers and provides in-process corrosion inhibition when not rinsed.